Most reasonable people know what to do with an oven – you bake cakes or broil toast with melted cheese. Bottom line, ovens are for food. Sadly, Kinny Redmon, 24, had no clue. Or she did, and she didn’t care because, in June 2015, she put her ex-partner’s pit bull puppy in the hot oven and killed it! She set the oven at 300 degrees, but the pup inside. Reportedly, Redmon and her boyfriend, Dimarrio Zander, had an argument and the next morning he left the house for work. Zander had left the puppy in a crate and Redmon was not around at the time. Later in the day, Zander got a message about getting his puppy out of the oven – when he got home, he saw the oven on and a chair was pushed up against the door. The puppy in the oven was dead. In March 2015, Redmon was given a year of ‘probation for disorderly conduct’ and was also asked to get ‘partner abuse counseling’. 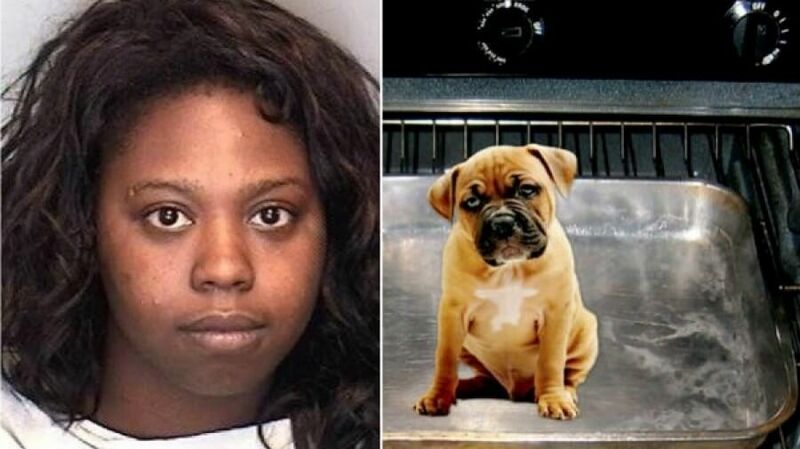 She failed to show up for probation or get counseling – and killed a puppy. The News Gazette reported that Redmon refused to talk to the police about the dog. Redmon, a mother, was expecting another child at the time. Is this woman the kind of person we need raising children?! At the time of the crime, she was living with her parents! Her bail was set at $250,000, and her case eventually went to trial. Tragically, Redmon was eventually acquitted. This was not justice. Share away, people.